Water Treatment Serivces - Diagnose your water problem. At Flow Water Solutions we diagnose your situation and provide a sensible solution to meet all of your water treatment needs. Your water safety is our first priority. We assess each situation as required from the well head through the water treatment system to the point of distribution of the building. We deal with private residential, designated and municipal sites. Water softeners – Our water softeners require only 8 pounds of salt per regeneration ( based on a standard cu ft / 30,000 grain media). They are controlled via a water meter to get the most out of the media before they need to be regenerated. We can custom make units for larger applications. Iron Filters – Our chemical free back washable iron filters require virtually no maintenance by the homeowner. Uv systems (Ultraviolet Systems) – Our Uv systems are designed to inactivate all coliform and E-coli in the water. Our Uv systems must be installed according to manufacturers spec. We recommend that every well should have a uv system installed and maintained for customers for piece mind that they are protected. R.O. Systems (Reverse Osmosis Systems) – Our R.o. systems are designed to provide safe potable drinking water. They are installed in conjunction with other treatment devices as required by the manufacturer. Low water recovery systems – In certain areas water wells do not provide adequate supply for peek demand use. We can provide an alternative open storage system to meet the peek demands for the property. Methane removal systems – In order for any water treatment to function properly, Methane must be removed from the water supply. Methane is a gas created by decaying organic vegetation, and can be explosive at certain concentrations. It must be treated with respect and we recommend using a licensed well contractor to handle the job. Whole house R.O. systems – High TDS (total dissolved solids) levels in water can be very corrosive. This can destroy fixtures and appliances in your home. If an alternative water supply cannot be found then a whole house, R.O. system can be installed to remove the high TDS in the water. Our systems can be designed to remove up to 3,000 TDS. Chemical injection systems – Chemical injection systems can be used to inject chlorine, flocculants, neutralizes into the water. Our systems are designed to pulse the product into the water at a controlled rate to produce a consistent concentration as required by the application. 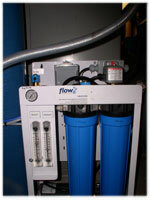 Filtration systems – are designed and installed to remove large particles in the water. As there are many forms of filtration, one has to be designed to meet the specific application. Please NOTE that the private residential water treatment systems are NOT regulated. Don’t be fooled, it’s “BUYER BEWARE” for private residential water treatment. There are “NO” licensing requirements for private residential water treatment systems. Please check with your local municipality on their variation of this bylaw. Here at Flow Water Solutions, we treat your site as if it were a designated site, where there are a set of rules and regulations. This means we only use those products that meet the highest of standards. We have the experience and know how to fix your problems right, the first time.